On October 6, 7.5 miles of city streets will once again be closed to vehicle traffic so that bicyclists and pedestrians can experience Los Angeles on their own two feet...or wheels. 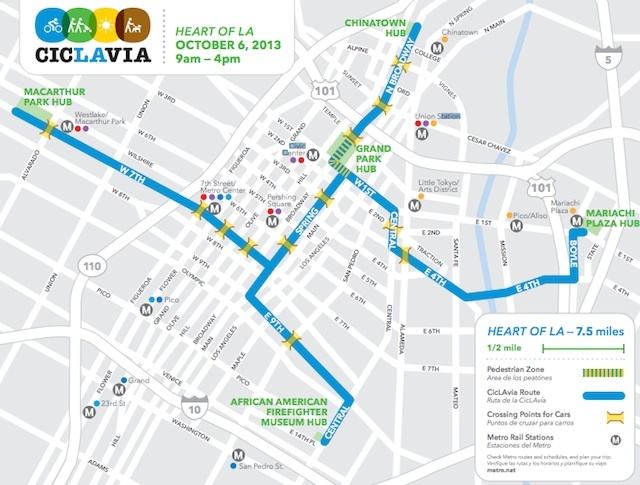 CicLAvia revealed this week plans and a route map for their "Heart of LA" event, which will be—where else?—in Downtown. The Heart of Los Angeles route follows in the footsteps of our first five events and helps Angelenos rediscover the origins of the City of Angels. Whether you’ve ridden these streets before or are new to CicLAvia, the Heart of LA route promises something new to discover. In April, CicLAvia went westward, with a 15-mile nearly straight shot to the Pacific. Quickly on its heels, in June CicLAvia hosted their longest, most walkable, and event-laden gathering to date, taking over Wilshire Boulevard for the day. See all of our CicLAvia coverage here.